Plated up, i havent gor the room for everything in seperate dishes on the table, and it just means more washing up. We have 15+ for xmas dinner. We serve ourselves in the kitchen from the pans and there is extra spuds, pigs in blankets and suace along with gravy are on the table. This is what we do in our family. The person who cooked also needs a rest, and is not a personal server .... If people want their food plated up they can go to a restaurant and pay accordingly. Parents and In Laws both put all the food in serving dishes on the table and everyone helps themselves. At my parents house its a free for all, its a bit more civilised at the In Laws ha. My mum has a hostess trolley which helps with keeping everything warm. I don't see the problem with having the food plated up. That's what we do at Christmas and just about every other day and certainly don't feel like we are back at school! Last edited by goggle; 08-12-2014 at 2:31 PM. "Always be calm and polite, and have the materials to make a bomb"
I have a kitchen diner, and find it easiest to plate up in full sight of guests sitting at the table, so that I can ask them how much they want on their plate. This seems to work well, and gets the food to the table quickly. From what I remember, when I was living at home, Mum always had serving dishes for the veg and gravy, although the meat was always put on the plate for you. I carve the turkey and ham just before we're ready to serve, then get everyone seated with a plate in front of them and dish up the meats, then bring the rest of the dishes to the table and everyone can either help themselves or ask for something to be put on their plate. We haven't really got a big enough table to have it all in the middle along with glasses of wine, crackers etc. so once everyone's got enough it gets put on the sideboard within reach if seconds are wanted. I'd hate to have no say in how much of everything went on my plate. We've always had it in bowls on the table, help yourself. Those not doing the dishing up get a head start, so they've pretty much filled their plate before the last dish has come to the table. It does take a bit of pre-planning - and having the right size/shaped dishes. Round dishes are pretty useless as there's so much wasted space between them. I liked to ensure things were served up in lasagne/similar dishes, with small portion items in good sized soup bowls. Meat is carved/sliced/portioned up and put into a dish, depending on the size that could also have chipolatas in a corner, or a foil wrap of stuffing. I would stack the Yorkshire onto a regular plate, a big Yorkshire cut into 8 slices. Some things can share a dish, e.g. all veggies can go into the same dish, except peas which can go into a big mug or a soup bowl. I have a kitchen diner, and find it easiest to plate up in full sight of guests sitting at the table, so that I can ask them how much they want on their plate.. In our family it wasn't about what they wanted, or how much of it - but individually which part they meant... and if you get it wrong/misunderstand what they say, then there'd be somebody having a huff. e.g. Yorkshires, corner or a middle bit? Roasties, which one, which shape, shiny or crispy, how well done, got your eye on that big one in the corner? or the two crispier/small ones underneath. Stuffing - foil covered/sloppy, or foil opened and just the crusty top part? It's all too hard ... people like to spot the bit, sausage, roast spud, etc that's caught their eye and just how they like it. I like food in bowls in the middle so people can serve themselves, but you need a lot of table space to guest ratio to do that & it might not be possible xmas day when people are usually squeezed in a bit. Giving everyone a small portion to start & then putting the remaining food in bowls sounds like a really great compromise. Goodness me it's a minefield! I never knew! 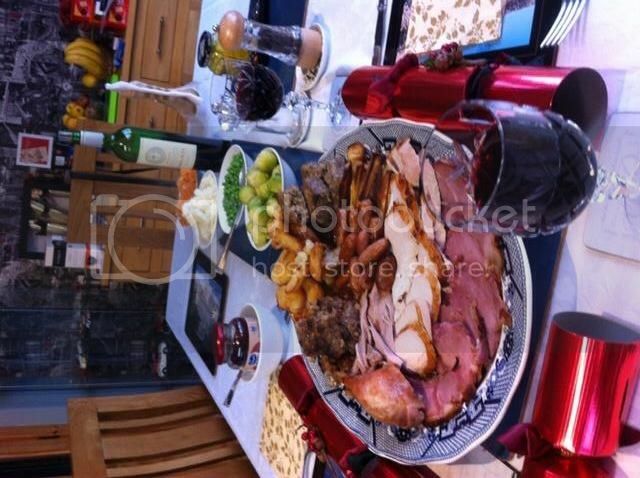 Oddly, was discussing this with the boyfriend the other day- normally for a roast we have everything in serving dishes and we help ourselves, but we have extra people round this Xmas so space round the dining table will be a bit (and couldn't fit 5 adults in the kitchen at the same time either). for this reason we reckoned it'd be much easier to plate ip everything together and keep additional plates on the table to a minimum. Depends on how many you've got coming and the space available. My mum would plate it up with everything she was cooking and tell you to leave the items you didn't like, so there was no this one doesn't like stuffing, they like stuffing but not sprouts etc. I've either plated or used our hostess trolley. It's a side one that remains on, so I don't know how the food would end up cold when serving from it? We haven't got the space to have everything in dishes on the table but the kitchen/dining room are quite open plan so everyone picks what they want while a couple of us plate it all up and then leftovers are all left on the breakfast bar for everyone to help themselves to more of anything as they fancy it. Many times buffet-style dinner means that there is no set table, and you sit. I have a bakers rack in the dinning room set up for self serve drinks. Why does plating up for people keep things hotter? Our roast dinners go in hot dishes in the middle of the table, then everybody serves themselves the nearest thing to them, then passes things along. Surely it's quicker to have 6 people serving themselves than for one person to serve 6 dinners? I suppose for things that can stay on the hob (with it on! ), plating in the kitchen might make sense but most of our food come out of the oven/off the heat to rest/drain so that doesn't apply. My mum always used to 'plate up' - and I hated it. Despite my saying that I loathed sprouts and soggy mashed carrot, and didn't want 8 roasties, she would insist on piling everything onto our plates until they resembled multi-coloured Mount Everests. ("Because it's Christmas"). Then, when we failed to clear our plates, she would moan about us 'wasting good food'. I plate the turkey and put the rest in serving dishes on the table - but mum still tried to pile sprouts onto my plate ('because it's Christmas'). Last edited by Silvertabby; 18-12-2018 at 12:34 PM. Serve yourself from pans/cooking dishes. The cook needs a rest too. My mum always used to plate up Christmas dinner, she knew who ate what veggies ... I can't get my head round this, I serve 5 veg types and I will eat all - but the only common ground is sprouts. I put Turkey, potatoes , pigs in blankets and parsnips on the plate and everyone helps themselves to veg from dishes so they get what they want, gravy is also on the table in a vintage boat but extra is available from the Pyrex jug if necessary.